Brooks, S.J. 1994. A taxonomic review of the common green lacewing genus Chrysoperla (Neuroptera: Chrysopidae). Bulletin of the British Museum (Natural History) (Entomology) 63:137–210. Brooks, S.J. 1997. An overview of the current status of Chrysopidae (Neuroptera) systematics. Deutsche Entomologische Zeitschrift 44:267–275. Brooks, S.J. and Barnard, P.C. 1990. The green lacewings of the world: a generic review (Neuroptera: Chrysopide). Bulletin of the British Museum (Natural History) Entomology 59:117–286. Canard, M., Y. Séméria and T. R. New (eds.) 1984. Biology of Chrysopidae. Dr W. Junk Publishers, The Hague. Haruyama, N., A. Mochizuki, P. Duelli, H. Naka, and M. Nomura. 2008. Green lacewing phylogeny, based on three nuclear genes (Chrysopidae, Neuroptera). Systematic Entomology 33(2):275–288. McEwen, P., New, T.R. and Whittington, A.E. (eds) 2001. 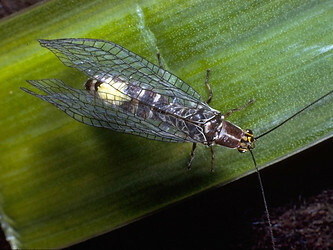 Lacewings in the Crop Environment. Cambridge University Press, Cambridge. Tauber, C.A., Tauber, M.J. and Albuquerque, G.S. 2001. Plesiochrysa brasiliensis (Neuroptera: Chrysopidae): larval stages, biology, and taxonomic relationships. Annals of the Entomological Society of America 94:858–865. Winterton, S.L. and Brooks, S.J. 2002. Phylogeny of the Apochrysine green lacewings (Neuroptera: Chrysopidae: Apochrysinae). Annals of the Entomological Society of America, 95, 16–28. Winterton, S.L. & de Freitas, S. 2006. Molecular phylogeny of the green lacewings (Neuroptera: Chrysopidae). Australian Journal of Entomology 45:235–243.